I t’s the 28th of February 2019. 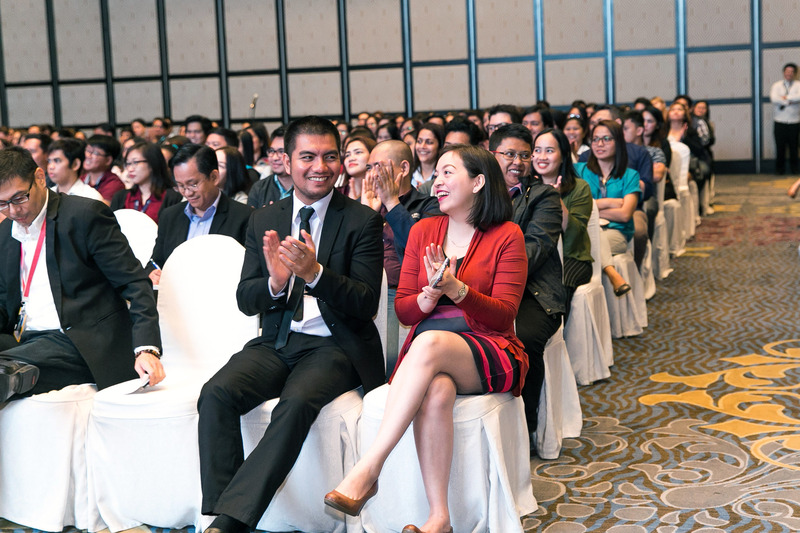 More than 300 colleagues are gathering in the Grand Ballroom next to the Lufthansa Service Centre in Manila, Alabang. 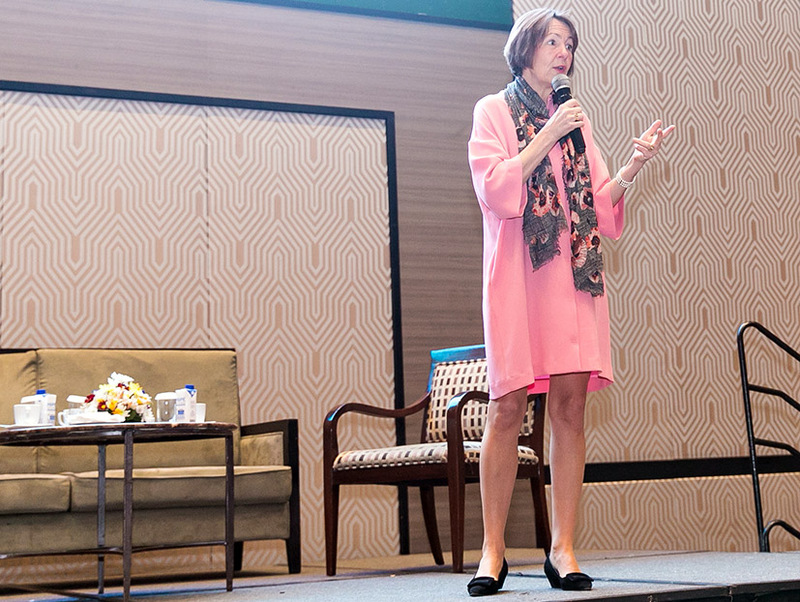 Positive excitement ripples through the audience: They are expecting one of the most important guests since Lufthansa Services Philippines (LSP) opened its doors to enter the stage. Dr. Bettina Volkens is visiting the Service Centre in Manila. Dr. Bettina Volkens is member of the Executive Board of Deutsche Lufthansa AG; her responsibilities include Human Resources and Legal Affairs. Dr. Volkens is a member of the Executive Board of Deutsche Lufthansa AG, and responsible for Human Resources and Legal Affairs. Tobias Voegtlin, Head of Customer Servicing Operations and CEO of Lufthansa InTouch, as well as Astrid Hartmann, Managing Director of Lufthansa Group Business Services (LGBS), are joining Dr. Volkens on her visit. Tobias Voegtlin, Head of Customer Servicing Operations and CEO of Lufthansa InTouch, as well as Astrid Hartmann, Managing Director of Lufthansa Group Business Services (LGBS), joined Dr. Volkens on her visit. The seven focus areas identified by the LH Group Board of Directors for 2019 are in the limelight of Dr. Volkens’s speech: She outlines the importance of Customer Centricity and Digital Delivery; she emphasises on Corporate Responsibility, Lean Management, and the Next Level of Leadership; she points out the significance of the Eurowings Turnaround, and most importantly – of striving for Operational Excellence. Positive energy fills the conference hall when Dr. Volkens addresses the audience. Ronilo Mendoza (Site Operations Manager Lufthansa InTouch Manila) and Hermiliza Salvaldor (Customer Service Manager, Lufthansa InTouch Manila). Looking back at the past months where the airline industry faced a high number of flight irregularities, Dr. Volkens emphasises that it is vital to take the learnings from last year and improve our services across all product areas. But she is convinced: “I know we can deliver”. Further to this, Dr. Volkens acknowledges the successful partnership of Lufthansa InTouch and LGBS in the Philippines. The two Lufthansa Group business units operate under the umbrella of Lufthansa Services Philippines (LSP). Since the service centre’s inauguration in October 2016, LSP records a strong growth. Today, more than 560 staff members are employed at LSP in Manila – with an equal split between Lufthansa InTouch and LGBS. 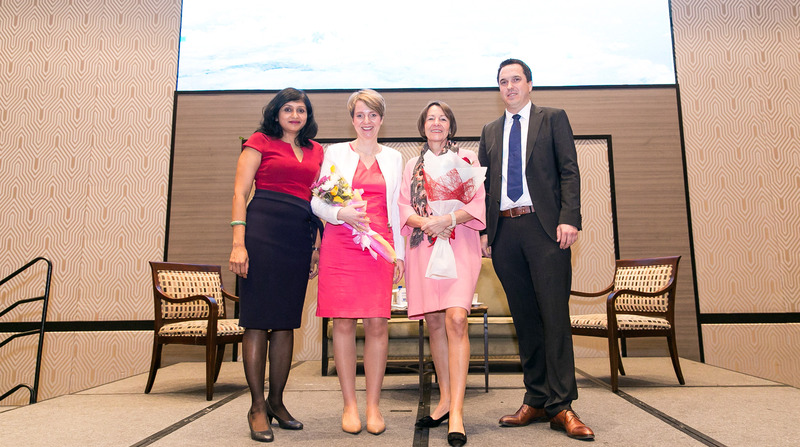 Successful partnership in the Philippines: Tobias Voegtlin (Head of Customer Servicing Operations and CEO LH InTouch), Astrid Hartman (Managing Director of Lufthansa Group Business Services LGBS), and Sharmini Krishnan (Managing Director, LSP). “Dr. Volkens’s visit at the Customer Service Centre in Manila indicates the increasing importance of Customer Service in the LH Group; it also values the proficiency and commitment of the Manila based colleagues”, says Tobias. LSP sets a very strong focus on offering excellent quality to their internal customers offering business administration services (LGBS), and to the passengers flying with the airlines of the Lufthansa Group (Lufthansa InTouch). Initially, General Reservations for English speaking markets represented the core business of the Lufthansa InTouch site in Manila. Over the past months, a good number of teams were up-skilled; they now cover status services as well. 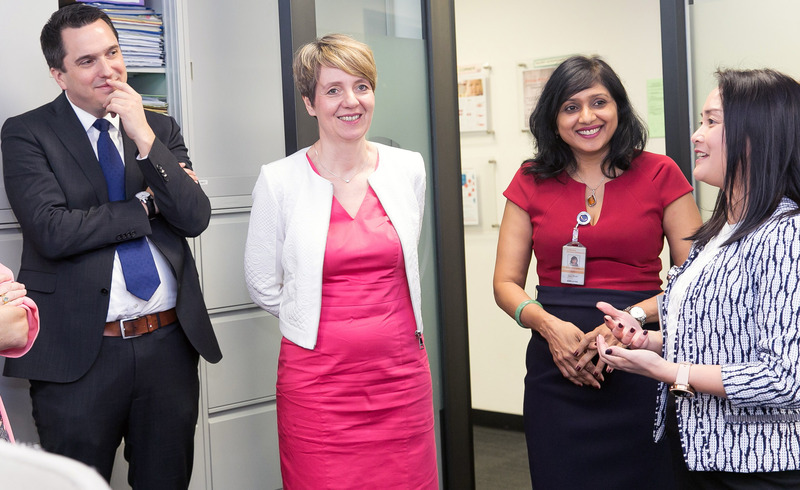 Insights into the operational heart: Dr. Volkens gets first-hand information at her guided tour on the customer service floor. “Looking at the growth of Lufthansa InTouch Manila, the Service Centre significantly contributes to stabilising Lufthansa InTouch’s operational performance”, says Tobias. “Further to this, their efforts contribute to improving Lufthansa InTouch’s competitiveness on the market”. Dr. Volkens’s speech followed a walk across the operational ‘floor’. Visiting the operational heart of the service centre, Dr. Volkens gains in-depth insights into daily operations. Most importantly, she seeks direct exchange with the Customer Service Consultants. 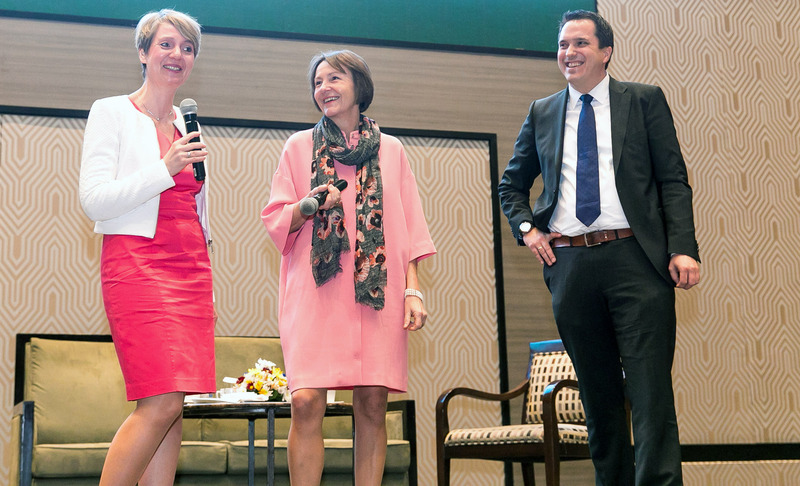 Manila based colleagues are taking this opportunity to share their journey since joining LSP; they highlight how the corporate values of the Lufthansa Group became more and more relevant to them in these past 2+ years since LSP opened. When Dr. Volkens left for the airport, they all agreed: Her stay in the Philippines might have been short, but they spent an exciting day together. Definitely a visit to remember!